Looking to liberate the movies in your DVD collection from the confines of their plastic-and-metal prison so you can enjoy them on your iPhone, iPod, iPad, and Apple TV? Well look no further—all you need to do is get some free software and follow a few steps. The first time you launch HandBrake and attempt to scan a DVD, the software will inform you that you need additional decrypting software and will offer to send you to a page where you can download the libdvdcss installer (currently version 1.2.12, although you can always find the latest version here). Run that installer, and it will put libdvdcss where it belongs on your drive. Now you’re ready to rip. Now insert your DVD into your Mac’s DVD drive and launch HandBrake. By default, the app opens a dialog box and ask you to select the DVD mounted on your Mac (you can turn off auto-prompting in the General pane of HandBrake’s preferences if you prefer). Choose your DVD and click Open, and HandBrake then scans the DVD for the titles it contains. Once the scan is complete, HandBrake chooses what it thinks is the main title, but you can click the pop-up menu next to Title and choose the item you want to encode. Generally speaking, the title with the longest duration is the DVD’s main feature. Want to make sure you’ve chosen the right title before you start encoding? Pick the one you think you want, then click the Preview Window button and a new window opens up. From there you can scroll through ten still images from the title or, if that’s not good enough, choose to encode and watch 15 to 240 seconds of the title (in 15-second increments). 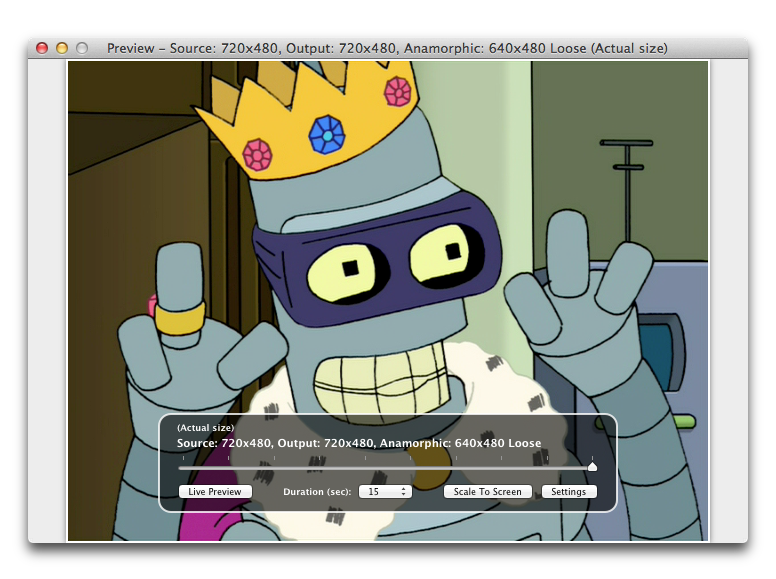 Bender’s the king, baby! Yep, that’s the episode I wanted. If you encounter problems such as HandBrake quitting or crashing when it scans your DVD, or a DVD with 99 titles of almost the same length, you’ve run into copy-protection scheme meant to thwart ripping. In that case, launch Apple’s DVD Player application, and navigate through the warnings, ads, and previews until you’re playing the main feature. Then choose Go > Title from the menu bar, and find the title with a chek mark next to it. 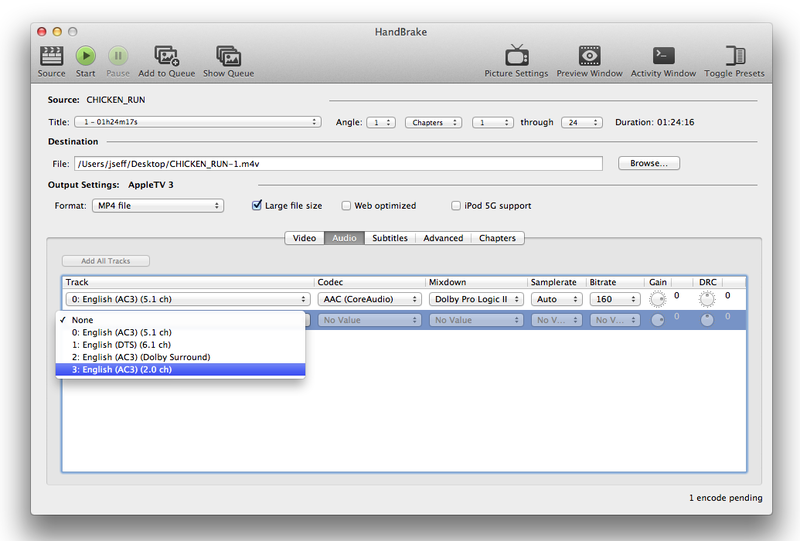 In HandBrake choose File > Open Source (Title Specific), select your DVD, and enter that title number in the box and click Open Title. Want to rip everything on a particular disc? There’s a button for that. 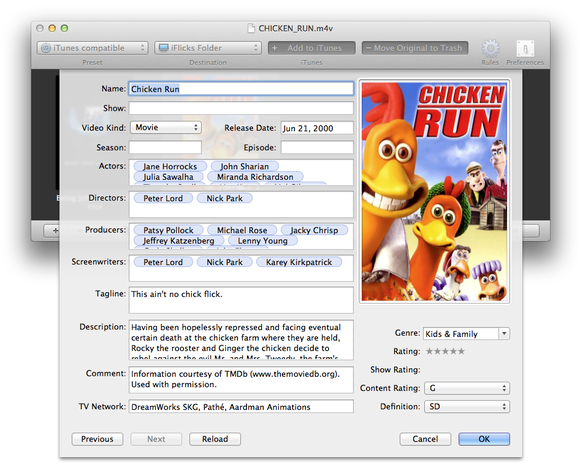 If you want to convert several items—all the episodes on a TV show DVD, for example—you can select one item, click the Add To Queue button, and then repeat the process for each item until you’ve added them all to the encoding queue (you’ll want to adjust your encoding settings prior to adding the items to the queue, however, which I’ll discuss in the next step). Rather than worrying about overwriting items in the queue if you forget to rename each before adding them, you can go to the General tab of HandBrake’s preferences and choose Use Auto Naming (uses DVD name and title number), which makes sure each title has a unique filename. You might even find it easier to choose File > Add All Titles To Queue, which as you might expect adds everything to the queue. From there you can delete any title that you don’t want to rip by clicking the X to the right of each title’s name. You can pick a preset and make it your default, or you can create your own. Now that you’ve decided which title(s) to rip, you need to choose your encoding settings based on the device(s) on which you plan to view the content. 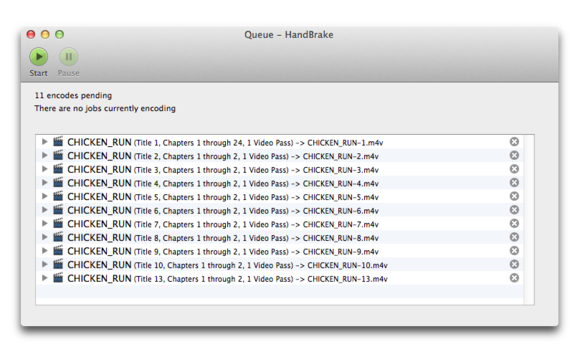 Although you can tweak every aspect of encoding, HandBrake includes handy presets that make it much easier. Generally speaking, I advise using them. If the Presets Drawer isn’t already open, click the Toggle Presets button at the top of the HandBrake window (or press Command-T). In the drawer, you’ll see two types of presets: Devices and Regular. In most cases, you can just focus on the Devices section. There you’ll find options for Universal, iPod, iPhone & iPod touch, iPad, AppleTV, AppleTV 2, AppleTV 3, Android, and Android Tablet. If you want to watch your movie on an iPhone, for example, choose iPhone & iPod touch for the best-quality settings that will work on that device. The same goes for other devices, based on their playback restrictions. 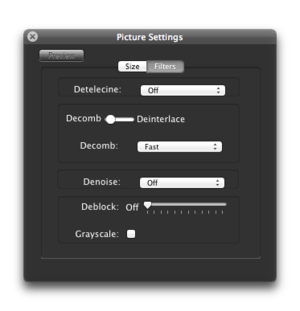 The Universal preset is helpful if you want a file that will work on all current Apple devices. If you find a preset that you plan to use often, you can set it as your default (otherwise, HandBrake defaults to Normal as its preset). Highlight the preset you want, then at the bottom of the Preset Drawer click the gear icon and choose Make Default from the drop-down menu. You’ll know it worked if your chosen preset now appears in bold. Also note that you can create custom presets for specific needs, such as after makingany of the tweaks discussed next that you want to use again. Once you pick your preset, there are a few settings you might want to tweak, depending on your specific needs. Decombing/deinterlacing: Many TV shows you’ll find on DVD are interlaced—that is, each frame displaying on screen as even lines and then odd lines (as opposed to progressive video, which refreshes all lines in order per frame) that can lead to jagged video when viewed on your computer or portable device. To overcome this, HandBrake can deinterlace while it rips so that the video will be smoother when you view it. The downside to deinterlacing, however, is that you sacrifice some picture quality. 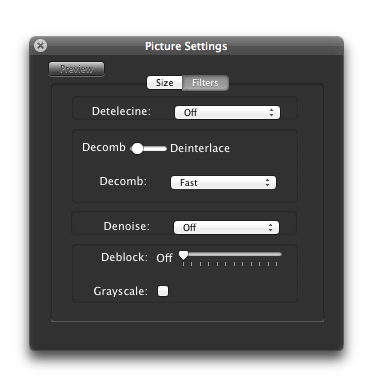 The Picture Settings display lets you turn on decombing or deinterlacing, among other things. Audio Altering or removing audio tracks is a great way to reduce the size of your finished file. Click the Audio tab, and look at the audio tracks your preset has selected to include. There may be language tracks you don’t need, or if your Apple TV isn’t connected to a surround-sound audio system, you may want to remove a 5.1-channel audio track or down-mix it to stereo, for example. Don’t need a particular audio track? Get rid of it. Subtitles If your movie is in a foreign language, or you have a hearing impairment and need to read the closed captions when you watch, HandBrake’s Subtitles tab is the place to look. There you can find whatever subtitle or captioning data comes on your DVD and decide which to include in your ripped file. 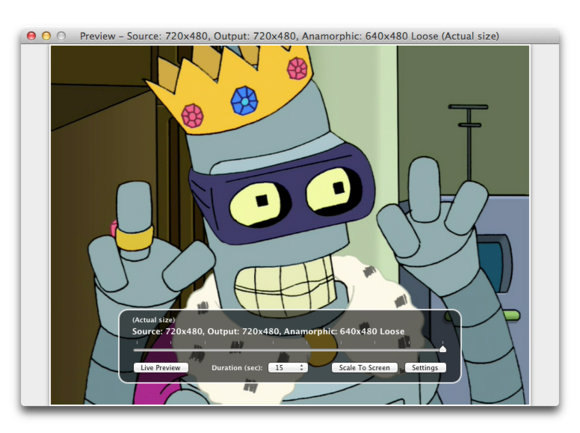 Typically, subtitles must be burned into your file, meaning you can’t turn them on or off, whereas closed captioning data is added as a separate text track that you can choose while watching in QuickTime, for example. You can also add an external .srt text file for the movie if you have it (one you downloaded, say). When you’re all set, click the Start button and go take a nice walk; depending on the length of the files and the speed of your computer, it can take a while to transcode the video. While this last step is very much optional, adding cover art, cast names, summaries, and the like will make your movies or TV shows look and act a lot more like those purchased from the iTunes Store, sorted and grouped correctly in iTunes and on your devices. A tagging utility like iFlicks can fill your rips with useful metadata. Several applications can look up metadata online and add it to your files. Rodney Kerstetter’s free MetaX is designed for that purpose (and HandBrake even has an option to send completed rips to MetaX directly). But Chris Marrin’s free Video Monkey and (my personal favorite) Jendrik Bertram’s $20 iFlicks are video-encoding applications that you can use just to add metadata. Whichever software use, once you’re done, just add the movie to your iTunes library and it will then ready for you to transfer (or stream) to your devices.